Scrub beets and trim off tops. Divide onto two large sheets of aluminum foil and drizzle each with a tbs of olive oil. Add shallots, three whole sprigs thyme each, and season moderately with salt and pepper. Wrap into packets and place on the top rack of a heated outdoor grill (or roast in oven) until tender to the tip of a knife; an hour or more. When done, cool beets and gently rub skins off using paper towels. Discard thyme. 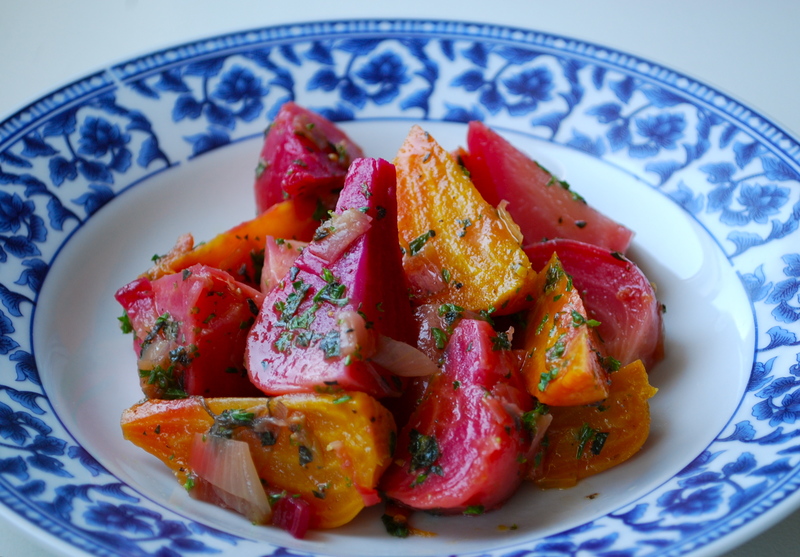 Quarter beets and slice shallots and place in a medium bowl. Add the chopped leaves from the oregano and toss with remaining olive oil and rice wine vinegar. Season to taste.